Are you ready for some football? Whether you are or not, I’m guessing you’re at least ready for a beer – maybe a football-themed beer? If so, you’re in luck. The Seattle Seahawks have teamed up with Elysian Brewing Company to brew the official beer of the Seattle Seahawks: The Noise Pale Ale. It seems like you can’t throw a rock in Seattle these days without hitting a brewery, but I don’t think that’s a bad thing. Despite the large and ever-increasing number of craft breweries in Seattle, we still don’t seem to have reached the saturation point. I believe that’s because Seattle craft beer drinkers really love to drink local. Sure, Seattle has its iconic and big name breweries that are well known even outside the Seattle area. Others, however, have a more local, neighborhood feel and here in the Northwest we love to support small neighborhood businesses. That’s why two local, neighborhood breweries, Belltown Brewing Company and Schooner Exact Brewing Company, to form a new, limited-series collaboration brewery named SODO Brewing. Last night my wife and I, along with several other members of the local media, were fortunate to attend a special preview night at Seattle’s newest craft beer and gourmet food spot: Tankard & Tun. Created by Charles and Rose Ann Finkel, the same people who brought you Seattle’s iconic Pike Brewing Company, this Oyster bar and restaurant is a bit more upscale and, fittingly, is right upstairs from The Pike. I first told you about Tankard & Tun back in April, when it was first announced and the Finkels were deep into construction and planning. It’s a beautiful, spread out space with a moderately sized bar area (the only section that is 21 and over only) a fermentation deck and few separate seating areas, including a private event mezzanine that’s upstairs but somehow still doesn’t make you feel removed from the market. Posted in Ale, Award Winning, Beer, Best Of, Branding, Brewery Equipment, Brewery Expansion, Brewing, Brewpub, Cider, Craft Beer Bar, Craft Brewery, Distribution, Downtown, Draft, Events, Expansion, Flight, Food, Golden Ale, Golden IPA, Grand Opening, Hops, Imperial, IPA, Liquor, Local, On Tap, Opener, Opening, Pairing, Pike Place, Promotion, Pub, Pubs, Restaurant, Restaurant Review, Review, Scotch Ale, Seafood, Seattle, Service Review, Spirits, Stout, Summer, Taproom, Taps, Tasting, Tour, Tripel, Washington, Washington Beer, Washington Cider, Washington Wine, Waterfront, Welcome, Wine. I’ve never given a lot of thought to bottle openers or to ‘venting’ cans. Since I drink the majority of my beer these days either on tap or from a growler, I don’t often have use for a bottle opener or much reason to vent a can. I’m also, in general, not a huge fan of cans anyway. I totally understand why they’re back, why so many craft breweries are canning their beers and why they’re popular but, if I have to purchase packaged beer, I’ve always preferred the bottle over the can. It’s just my personal preference. In addition, my days of drinking straight from the bottle or the can are pretty much over. I used to drink beer that way, back in my college days, but no more. Perhaps some of you think that makes me a beer ‘snob’. I don’t agree. 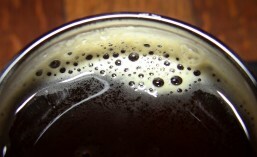 I just prefer to drink my beer as it was intended to be: out of a glass. Granted, if I’m offered a beer somewhere in a bottle or a can and there’s no glassware available, I will go ahead and drink it from the bottle/can. Again, it’s just not my preference. Having said that, I know that I may be in the minority. Not everyone drinks the majority of their beer on tap or in growlers as I do. If they did, there wouldn’t be much of a reason for breweries to package their beers now would there? Also, I obviously have need of a bottle opener at times. Not every beer I drink comes from a tap or growler. We’ve also reached the point where some beers only come in cans. So I do occasionally find myself opening a can rather than a bottle. You can’t fight change. 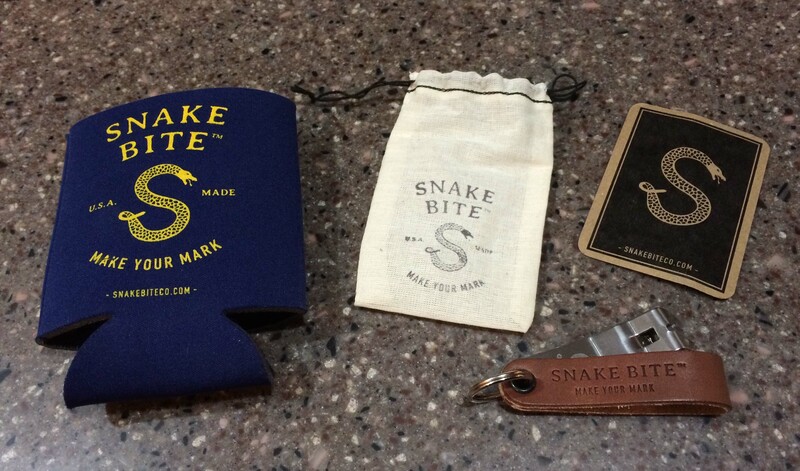 So, when the Snake Bite Co. contacted me about trying out their product, I figured I’d give it a look.